Being a local government employee, I benefit from the Nevada statehood holiday. Strangely, or not, it coincides with Halloween. Some, mostly those who mispronounce its name, probably think that makes Nevada a scary state. Regardless, I took advantage of the holiday to run up to Cold Creek for ninety minutes of fishing. 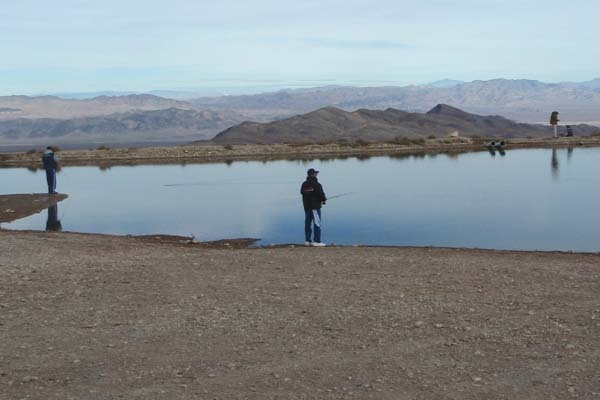 From my perusal of the Nevada Department of Wildlife (NDOW) website I noticed they stocked the little pond on October 23. I say Cold Creek is little because even when at capacity it can't be over two acres in size... maybe 100,000 surface square-feet at most. Despite the cold front that blew into the valley on Wednesday I decided a quick trip to Cold Creek was needed before all the meat anglers depleted the pond of its little jewels. I tried to cajole my son Brian into going with me to “get out of Dodge” as they say. But he feared it would be cold and windy on Saturday morning. Turns out this morning was calm, but cool. The temperature upon arrival at 8:30am was about 45 degrees. But since there was no wind it was very tolerable. There were two gents slinging hardware (i.e., metal spinning lures) into the pond when I arrived. They were from Las Vegas and were clearly harvesting fish for a meal. They had a few on a stringer that were slapping around near the shore. Unfortunately for them, they did not realize that the average size of these little stocked trout was about 9.2 inches, making it difficult for most of them to get their mouths around the metal lures, assuming they wanted to eat those things. In contrast I had the perfect weapon for these little fish... flies tied to resemble little bugs. 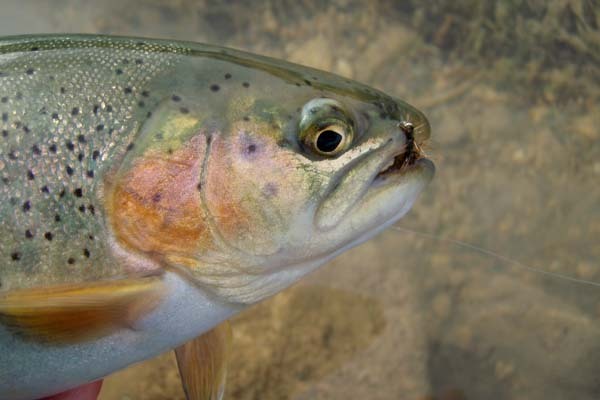 Trout naturally feed on aquatic insects. Bugs that live their nymph stage in the water clinging to rocks and weeds. As they transform from nymph to full grown insect they emerge from the water to molt into mature winged bugs that mate and drop their fertilized eggs into the water, starting the cycle of life all over again. 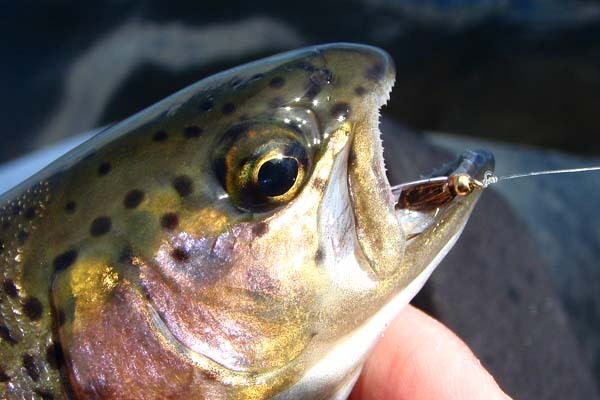 The point is that trout eat bugs, and the closer you can resemble the bugs they are eating the more successful you will be. Of course they will eat other food that resembles or smells like something edible (e.g., worms and cheese-ball bait), but there is no debating that they eat aquatic insects. In ninety minutes I landed well over fifteen trout, maybe even twenty. I lost count. On several occasions I caught three in a row on successive casts, much to the dismay of my fishing company. Most were as advertized on the NDOW website: about nine inches. I did land several close to eleven inches, and two plump ones close to twelve inches. What I found especially nice was that they were deeply colored, and many leaped wildly out of the water. 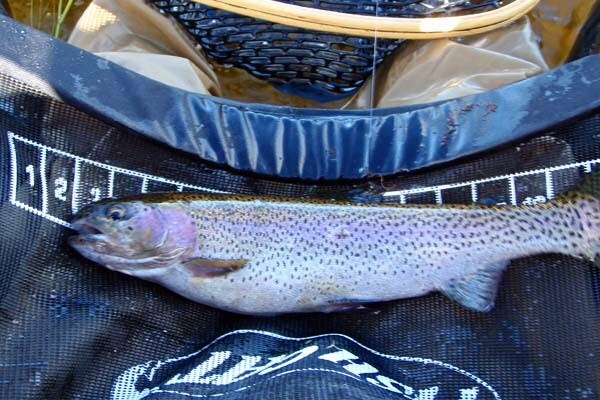 The NDOW website indicates these Cold Creek trout were stocked from the Mason Valley Hatchery near Yerington, NV; looks like Mason Valley produces some healthy, nice looking rainbow trout. 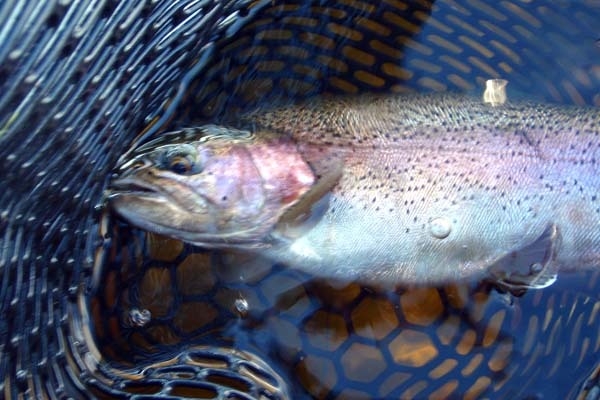 I was using my newly built seven foot, six inch fly rod with a four-weight sinking fly line. It was a blast. I was casting size twelve still-water nymphs. One of them lacked a tail and it sometimes acted as a dry fly sitting on the surface. 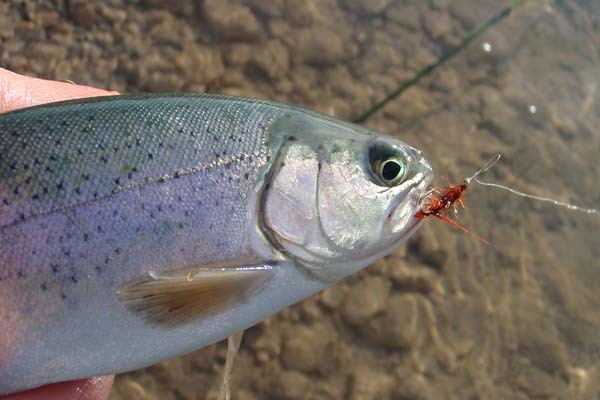 I noticed a trout rose to the surface to strike it, and for a while I fished it as a dry fly. I took four nice trout using that tactic. Before I got into my truck to depart, I talked with one of the fishermen who was there when I arrived. He claimed to have loaned his fly rod to his sister or daughter or someone, which made no sense to me at the time. He asked to see the flies I was using. I opened my Wheatley box and showed him the flies. I told him how I would rig up my spinning rods for my sons to fish flies. He seemed sincerely interested, and so I gave him a couple of flies. As I was driving up the dirt road I looked into my rear view mirror to witness him dragging the nymph on the end of a bobber as if it were a spinner. I reckoned that my first impression about the “loaning” of his fly rod to someone else was right on... he clearly was not a fly fisherman. For the past twenty-five years I’ve been practicing catch and release, returning the fish to their environs, hopefully to grow larger and be caught again by another catch and release angler. 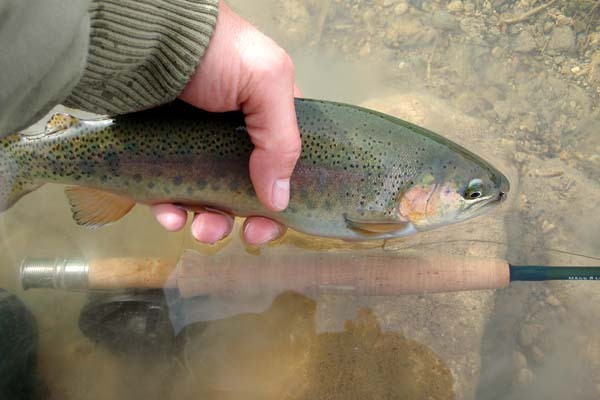 I was glad to have released all those Cold Creek trout back into the pond. Maybe the fishermen I left behind caught a few of them, who knows for sure. One of them made a disdainful comment or two about my catch and release practices, especially when he saw me release the larger ones. But I always feel a sense of joy returning fish unharmed to the water. The excitement is in the casting and catching, not the killing. And with little ponds like Cold Creek, the stocked fish can be harvested out within a month if the fishing pressure is hard. Putting them back in prolongs the fishing enjoyment, for most of us anyway. I stole another “sanity” day from work to fish Wayne Kirch Wildlife Management Area (KWMA) on Thursday. My boss told me to take time off now since the next six months will be too busy to allow it. I didn’t say it at the time but I thought, “Heck, it’s always that way around here... it never lets up.” Nonetheless, with her permission I took advantage of the hole in my schedule to sample the fall weather at the KWMA. 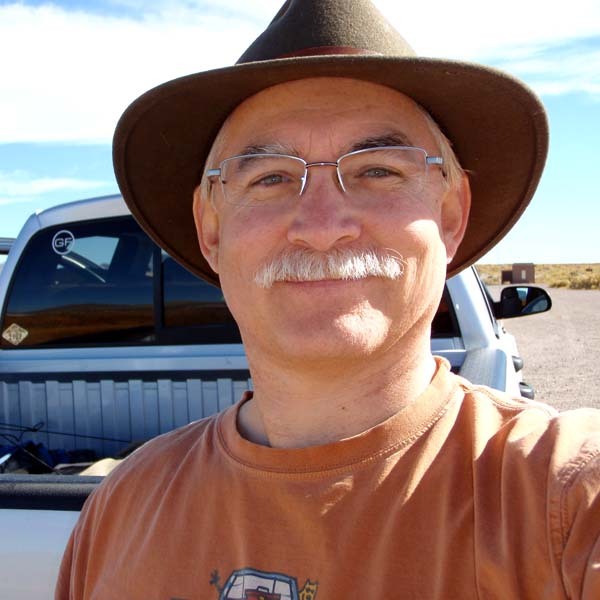 The KWMA is located in the White River Valley in northeastern Nye County off of State Route 318. It is composed of a total of 14,815 acres, including five reservoirs. 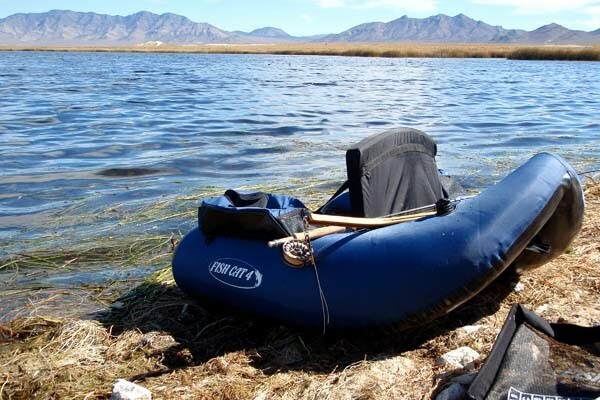 The KWMA habitat, raging from sagebrush to wet meadows and grasslands, supports an abundance of fish and wildlife. 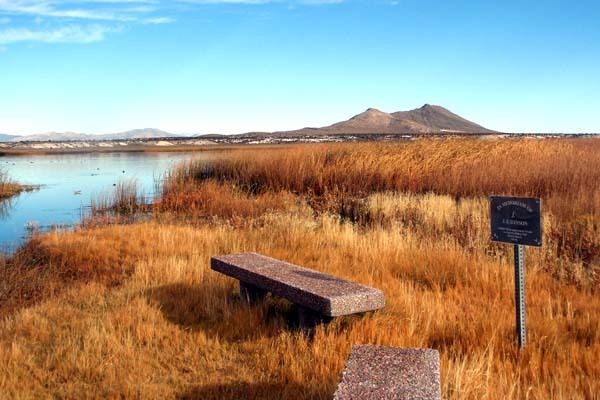 Its wetlands are among the most productive wildlife habitats in Nevada. It provides food, cover, and water for numerous species of birds, mammals, reptiles, and amphibians. The Tule, Adams-McGill, Cold Springs, Dacey, and Haymeadow reservoirs provide water habitat for fish and waterfowl (although I’ve never read fishing reports on Tule Reservoir). The uplands on KWMA include sagebrush, alkali desert scrub, annual grassland and desert wash. Sagebrush provides important habitat for mule deer, pronghorn, and sage grouse. The State of Nevada purchased the KWMA land from Ervin Hendrix in 1959, who had purchased it from the Adams-McGill Company in 1943. The state wildlife agency purchased the land (formerly known as Sunnyside) for its wetland waterfowl value. The four major reservoirs within the 14,815 acres are Adams-McGill (785 surface acres), Dacey (185 surface acres), Cold Springs (275 surface acres), and Haymeadow (190 surface acres), but to date I’ve only fished Cold Springs and Haymeadow (thus, I have reasons for more KWMA visits). When I arrived at Haymeadow at 8:30am, after my 2½ hour drive, the temperature was just getting to 50 degrees from its overnight low in the mid-30s, but by noon it had warmed into the low 70s, although the water temperature did not feel that cold...yet. 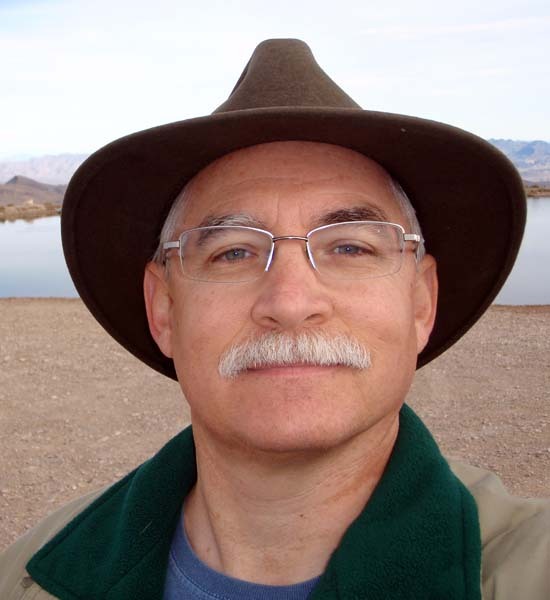 All the KWMA reservoirs are relatively shallow, with depths averaging six to seven feet. The water weeds, while starting to fade in the cooling temperatures, were still occupying much of the lake’s volume. Navigating the float tube wasn’t the issue as much as casting along and between the numerous weed beds. Except for a small, short lived, late morning mayfly hatch most of the trout were feeding three to five feet under the surface. I had equal luck with several flies, including small brown and green streamers, hares ear and beaded prince nymphs, as well as callibaetis nymphs. 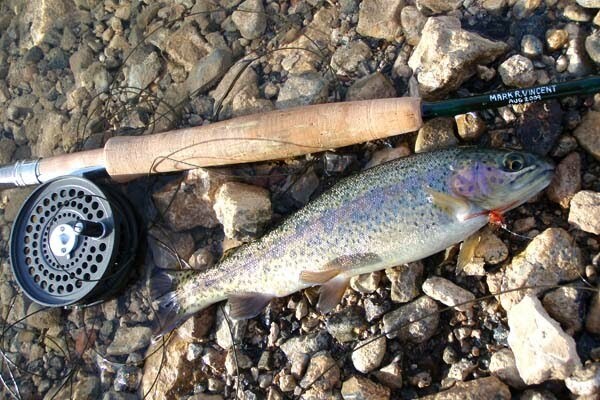 Action was fairly good from the start, but most trout seemed around twelve inches, plus or minus. They were pretty rainbows with deep, saturated colors. By mid-day I started to hook up with larger trout, with a smattering of small bass (eight inches and smaller) that were getting active as the temperature warmed. I did not count the fish, but I was easily over 20 fish by the end of the day. I was using a 4x tippet testing at about 5 pounds, and I think that gave me a false sense of security to play the fish harder. I didn’t want to lose flies in the weeds, and you can really haul in twelve-inch trout on a 4x tippet. But that kind of muscling won’t work with larger, heavier fish. 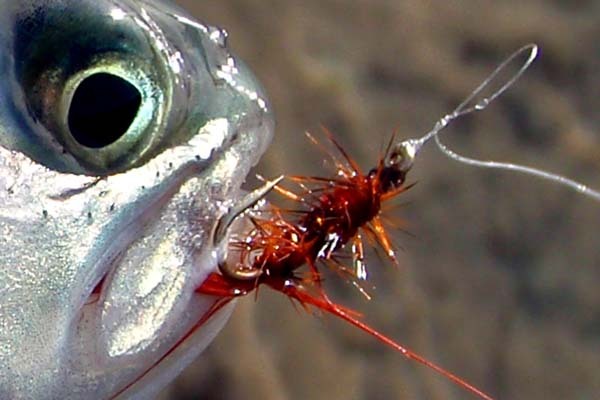 The result often becomes the hook tearing out of the lip rather than the big fish coming to the net. And so, I lost many trout with hook pull-outs that day... but I never lost a fly. A stupid trade off, I know. I did land two rainbows around sixteen inches, and two others around fourteen. But my best hook-up of the day came around 1:00pm in a relatively shallow, weedy portion near Haymeadow’s earthen dam. I could sense it was large by the electrified pulsation it sent through the fly line as it thrashed its head under the water. It was the only fish of the day that I decided to play off the reel. With trout fifteen inches or smaller I usually strip them in with my left hand while holding the rod in my right casting hand, but since I was using a 4x tippet I had stripped in the two sixteen-inchers by hand... which might be why I lost so many trout. I like my reels to be right-hand retrieve, so when I decided to play this big trout off the reel I had to switch my rod hand from right to left and then I reeled like crazy to pick up the line laying on my lap. While doing that the trout thrashed on the surface and tail-slapped the line... his peduncle (the portion of his body preceding his tail, or caudal fin) was clearly visible and looked to be the size of my wrist. 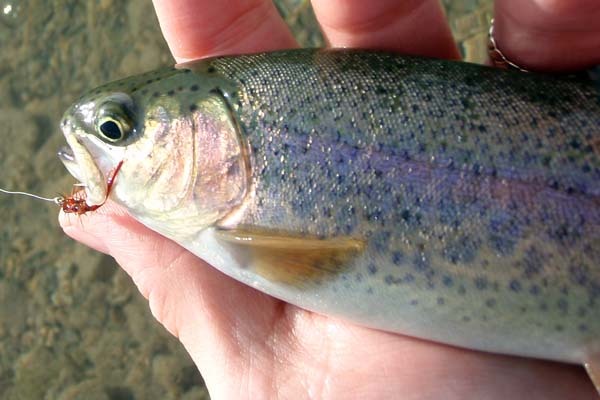 I quickly calculated a twenty inch trout of three to four pounds in weight. A few seconds after I got him onto the reel, and feeling a sense of relief for having done so, the hooked ripped out. I was not happy. I decided I had enough, and headed towards the boat dock. 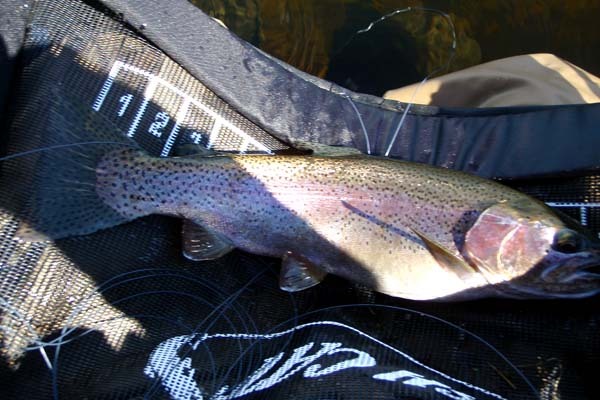 It was near the boat dock that I landed the second sixteen inch rainbow, and that helped me to deal with my loss of the big trout. It was a good day. I got out of the water at 2:00pm, and thirty minutes later after stowing away all my gear I had started my drive back home. I had the Haymeadow reservoir all to myself for five and one half hours of fishing. It was a good day to be fishing, and a good day to escape the demands of my job. Any day I spend fishing is such a blessing from the Lord... but the truth is that every day, no matter what the circumstances, is a day that deserves our eternal thanks to God our Father.